The use of essential oils and aromatherapy can be a super way to add some “zippity doo dah” to your place of work. If there’s already a little too much “zip” in the form of stress, anxiety and rushing about, the oils can help bring the energy down to a calmer level. When I lived in Rome, I worked in Human Resources for an agency of the United Nations. My boss frequently used homeopathic remedies to address his health issues. He was fine with my using a small diffuser at my desk. His only request was this: No Peppermint! No Eucalyptus! Why? Because he knew that both of those oils could make his remedies ineffective. The nature of my job made my office a beehive of activity with human traffic. By diffusing essential oils, my office was pleasant and comforting and kept me protected from all the airborne germs I was potentially exposed to with the high flow of activity in my space. 1. Feeling Frazzled and Tense. It’s one of those days when everyone wants something from you RIGHT NOW. Then there’s that one particular colleague who’s in real danger of having their head pinched off. You know who they are. Applications: Try to slip away for just five minutes to the break room, bathroom, stairwell or, ideally, outside. Remember that it will get better. Sniff from your bottle, an inhaler or even a tissue soaked in oils. Repeat a calming affirmation. If you really can’t get away, keep a bottle in your desk drawer for a quick sniff. I used to keep affirmation cards and oils in my desk drawer for quick calm-me-downs. 2. You’re Getting Veeerrry Sleepy. Two hours before you can leave. It feels like an eternity. You wonder if anyone will notice if you disappear for a quick nap in the conference room. Instead of grabbing your 17th cup of coffee, use the uplifting power of essential oils instead! Mentally Stimulating Oils: For mental clarity and stimulation the best oils are Rosemary, Peppermint, Lemon, Basil, Ginger, and Cypress. These oils can help with fatigue and lack of focus. I’ve read that placing a bright yellow paper at eye level helps stimulate the third chakra, aiding in memory and focus. Applications: Diffuse essential oil at your desk if you’re able, or keep an inhaler handy and sniff frequently. Move around. Stand and do a quick stretch, drink cold water and sniff your oils again. Once when I was a new mother and never had enough sleep, I went to the ladies room, filled the sink with cold water and splashed my arms and face. 3. The Office Smells Funny. Sometimes the places we work just smell weird. It’s especially noticeable when you first arrive. It might be the commercial cleaning products used, an unclean air system or even a co-worker. Air Purifying Oils: Any essential oil you enjoy will make the air smell better, though my personal favorites for deodorizing are Cypress and Lemongrass. Applications: Keep the diffuser at your desk going, spray the air with a bottle of essential oils and water. I’ve even tucked cotton balls soaked with oil under the desk for a “where is that lovely smell coming from” effect. 4. Monday Blues/Lack of Inspiration. The weekend was awesome and the aroma of toasted marshmallows still lingers in your hair. Now you have to put on a suit and act like a grown up again. Blech. Uplifting, cheering Oils: Any of the Citrus oil will cheer you up! Lemon, Orange, Mandarin, Lime, Grapefruit, Bergamot are all lovely. Personally, I love Grapefruit with a dash of Basil. To get your creative juices flowing, Neroli, Sweet Orange and Cardamom can assisting with creativity and inspiration. 5. Airborne Bacteria. Let’s face it, when you work with other humans, someone, sometime is going to bring in germs. It could even be you. You could wear a mask like the woman in the photo, but then you’d have bigger problems than bacteria. Like always sitting alone in the cafeteria or not getting invited to the staff Christmas Party. Antibacterial Oils: One thing all essential oils have in common is their antibacterial properties, so any oil you use will help. However, there are a few that have more germ-killing power like Tea Tree, Thyme ct linalol, Cajeput, Lemongrass, Juniper Berry. Applications: Spray the air, diffusion, you can even spray and wipe down your desk, telephone and anything else that people touch. As you can see, essential oils are an easy way to make a huge difference in the energy of a workplace environment. Tempers can be soothed, clarity can replace confusion, productivity increased, sick days lessened and your whole day can be brightened, just by using a few essential oils at your place of work. How about you? 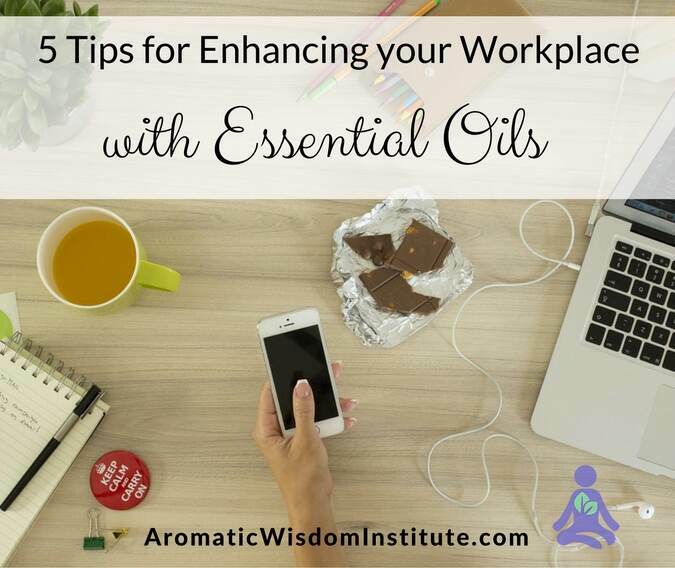 Do you use essential oils at work? Please share in the comments section below! Love essential oils and the many health benefits my family and I have enjoyed since finding them several years ago. They are life-changing, aren’t they Carla?! Thanks for stopping by! Liz..Great info. I don’t know a whole lot about essential oils but you have definitely peeked my interest! Thanks! Love the way you explain to us what all we can do to stay on track in our office and what we can do to keep it all clean! Love the oils; thanks Liz. You’re an awesome teacher! This is an awesome list…keeping it handy so I know what to use! I enjoy the citrus scents. It’s been so eyeopening to read all the different things you are presenting about essential oils and their benefits. Makes me wonder how our society got so far away from this practice in the first place. Thanks for sharing your knowledge Liz. I have been using oils for a couple of years now and would not be able to do without them!! Benefits are amazing! I love the oils. I’m so glad I found oils to help me though.. I am trying to stop taking so much medicine and use oils to help me..;) so far pretty good! What great uses! I had no idea of the ones that wouldn’t put you to sleep! Great info – I need lavendar and peppermint for sure!! This was a great post for me. 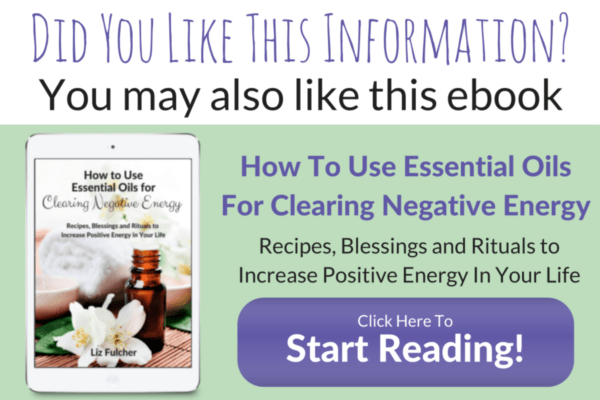 I have been looking for information on essential oils. I just bought some a few weeks ago. Grapefruit, Lavender and Sage. You know the sage oil splashed on my dining room table and ate through the varnish and the paint? How could that happen? Also why did your boss say no to peppermint and eucalyptus? I got lotion made with those 2 oils..
Suzanne, I’m so glad you’re starting to add essential oils to your life. 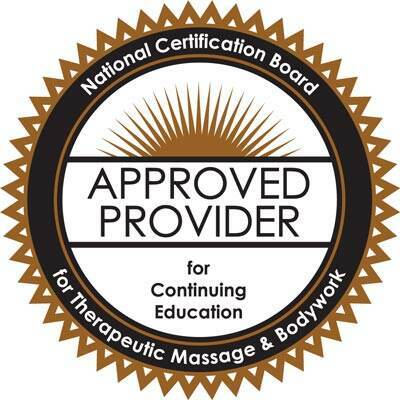 You’ll begin to see a big difference in your day-to-day health issues in no time! I’m sorry to hear the Sage did that to your dining room table. Can you tell me if it was “Salvia sclarea” or “Salvia officinalis”? Essential oils are highly concentrated products and some can be quite caustic to both our skin and delicate membranes as well as thin plastics and furntiure varnish. I have a lot of furniture that is pock-marked from essential oils eating through the varnish. Once I set a bottle of Basil on my dining room table and a drop ran down the side and formed a ring under the bottle. It’s still there, 10 years later! Be very careful when using essential oils Suzanne. The Lavender has few safety issue which is one of the nice things about that oil. Grapefruit can be phototoxic (will increase chance of sunburn), so be sure to use a carrier oil when adding it to your skin and stay out of direct sunlight or tanning bed for about 12 hours after application. My boss said no to Peppermint and Eucalyptus because those oils are both known to stop the efficacy of homeopathic remedies which he was taking. Are you using homeopathy? If not, then I wouldn’t worry too much about the lotion. It probably contains a very low percentage of essential oils. GREAT QUESIONS! Thank you Suzanne! Thanks Liz. I don’t know specifically what oil is the sage because what the shop does is dispense it out of a larger container and into viles. Great info you shared with me I really appreciate it! Hmm, I’m not currently using any essential oils. I do have scented candles though from Bath and Beyond. How do those compare? 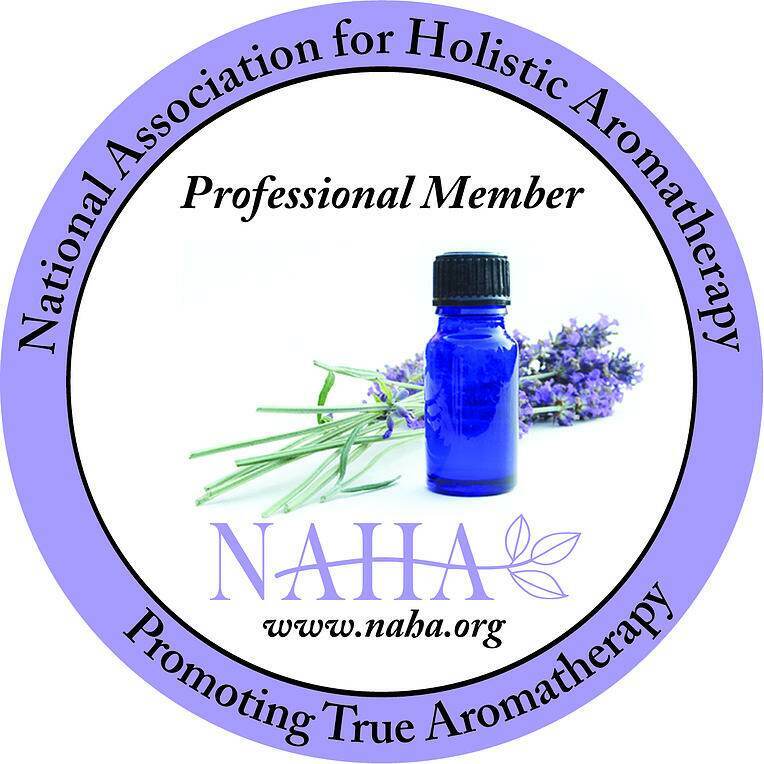 Great article and yes, I am definitely using aromatherapy sprays in my workplace. It’s amazing how after I spray in my office that my co-workers will comment things like “wow, I feel calmer” or “uplifted and brighter” etc. They definitely respond positively and they respond amazingly well to the scents. Sometimes they will even come in to borrow the spray for their own office. That’s wonderful Heather! Your colleagues are so lucky that you aren’t one of those ladies that uses artifically fragrancing. They are getting both the emotional and physical benefits of your efforts! Thanks for sharing. This made me really happy – I love hearing how people are using essential oils in the world. OMG, I am obsessed with essential oils. I had a severe allergic reaction a few weeks ago, was having trouble after major treatment in the ER with my respiratory issue. I contacted a DoTerra rep for the “breathe” blend which I had used before. Within 2 days of experiencing not only this blend, but other oils as well… I was hooked. Now I use oils everyday, and have been taking them to work with me. The doctors arrive on our unit, always saying how nice it smells. If you ever worked in an ICU, you know how ironic that is. after my coworkers noticed a difference in me, they started trying them too!! Now we have a calmer, happier intensive care. As you may have suspected, I signed up immediately with them for my discounts. If you agree that some people can be sensitive to or bothered by essential oils, surely the ONLY kind, respectful and therapeutic way to approach a workplace is to err on the side of caution and NOT put the burden on the people who are bothered to object? ! That’s manipulative and mean and it’s why some of us, who keep having these things thrust on us, are starting to be upset and push back. It’s fine to use these in a therapeutic setting, but to thrust them onto a group or for you to be encouraging that is irresponsible. It’s a slick marketing device and to use substances that can help people in a way that HURTS some people is a special kind of evil. Frankly, to me it gives the whole essential oils a bad name or shall I say a bad ‘smell’. Be decent, be caring and be responsible. This is anything but. You need more regulatory control if this industry can’t regulate itself. Do you have a diffuser you recommend for a small office? I am looking for something that won’t be too fragrant that will bother my co-workers and preferably that is battery operated as I don’t have a convenient plug in my office. I am a novice at oils use but loving the changes in my body and state of mind already. At work since I have my own office I have my little diffuser at the corner of my desk where I diffuse Stressaway, Frankincense or lavender depending upon my day. Otherwise I ingest peppermint oil with water and use SclarEssence Essential Oil for my PMS and hormones. Still loads of research is on and best immunity booster is Thieves!